Humans have become so powerful that we have disrupted the functioning of the Earth System as a whole, bringing on a new geological epoch – the Anthropocene – one in which the serene and clement conditions that allowed civilisation to flourish are disappearing and we quail before 'the wakened giant'. The emergence of a conscious creature capable of using technology to bring about a rupture in the Earth's geochronology is an event of monumental significance, on a par with the arrival of civilisation itself. What does it mean to have arrived at this point, where human history and Earth history collide? Some interpret the Anthropocene as no more than a development of what they already know, obscuring and deflating its profound significance. But the Anthropocene demands that we rethink everything. The modern belief in the free, reflexive being making its own future by taking control of its environment – even to the point of geoengineering – is now impossible because we have rendered the Earth more unpredictable and less controllable, a disobedient planet. 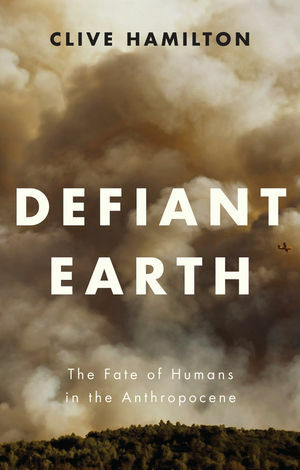 At the same time, all attempts by progressives to cut humans down to size by attacking anthropocentrism come up against the insurmountable fact that human beings now possess enough power to change the Earth's course. It's too late to turn back the geological clock, and there is no going back to premodern ways of thinking. We must face the fact that humans are at the centre of the world, even if we must give the idea that we can control the planet. These truths call for a new kind of anthropocentrism, a philosophy by which we might use our power responsibly and find a way to live on a defiant Earth. Clive Hamilton is Professor of Public Ethics at Charles Sturt University in Canberra and author of Requiem for a Species: Why we resist the truth about climate change and Earthmasters: The dawn of the age of climate engineering. Does history have a meaning?